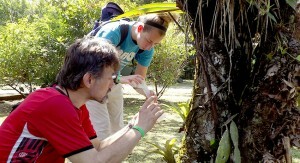 Doctoral student Kristin Duffield peers at a millipede in Professor Steven Juliano's hand. This is the second story in a five-part series on the School of Biological Sciences’ student research trip to Costa Rica. STATEside is along for the adventure and is publishing a story a day through Wednesday. A group of mating millipedes set off a scramble Friday afternoon just off a trail in a Costa Rican rain forest. A half-dozen Illinois State biology students dug through muddy leaves to gather the squirming arthropods for graduate student Kristin Duffield’s research project. It was a messy job made messier by the millipedes defecating as they coiled in the students’ hands. But no harm, no foul. They don’t bite, and though they release cyanide when they coil in a defensive posture, it is not in an amount that harms humans, Biology Professor Steven Juliano explained. 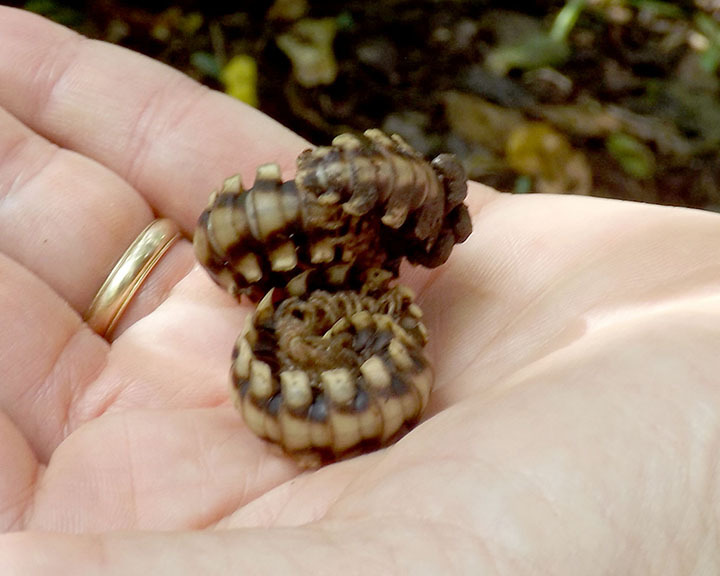 Duffield was collecting pairs of millipedes in order to study their mating habits. “I’m interested in mate choice and natural selection,” she said. Duffield and her 11 classmates in the School of Biological Sciences’ Rain Forest Ecology course must each complete a research project during their 10-day stay at La Selva Biological Station in northeastern Costa Rica. They arrived Thursday and will present their findings after they return to Illinois State December 2. Millipedes coil after being gathered by biology students as part of a research project. Duffield was fortunate that there were so many millipedes. One of the challenges the students face when doing their research projects is that they have to pick their project before they come to this unfamiliar tropical environment, Juliano said. The organisms that they plan to study might not be as abundant as they had thought, which forces students to change their plans. 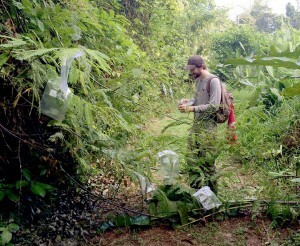 That had originally happened to Duffield and to junior biology major Sarah Kluk, both of whom had hoped to study golden silk orb-weaver spiders. Kluk had planned to look into the potential of females to eat their much smaller male counterparts and whether the amount of food a female had put a potential mate in lesser or greater risk. Though Kluk found 12 golden orb webs in the forest, she could not find any mature females. But finding the organisms is only part of the challenge. “You want to have a novel idea,” said graduate teaching assistant Molly Schumacher. Juliano said this isn’t always easy for students who sometimes choose a species before asking a question that may have been previously studied. “It’s best to think of good questions first,” Juliano said. The students only have 10 days for their projects and are allowed to conduct research on only plants and invertebrates at La Selva, in order to put less strain on the rarer vertebrate species. Several students were studying the abundant leafcutter ants, which march single file in seemingly endless lines across the jungle floor carrying a leaf particle larger than themselves. For most of the undergraduate students the trip was their first opportunity to conduct field research. That goes for junior Taylor Zarifis who worked with Juliano Saturday morning to extract water samples from the pools formed by the overlapping leaves of bromeliads. She was studying how much nitrogen was in the water and the relationship between the number of dead insects in the water and the amount of nitrogen, which benefits the plant. Juliano said that in a wider context, Zarifis is trying to draw a connection between carnivorous plants and bromeliads. “It’s interesting being in the rain forest and seeing all the different species and doing my own research project,” Zarifis said. Biology Professor Joseph Armstrong said what is important for the students is the research process, and not a focus so much on the outcomes. “You can either learn about science (passively) or you can do science, engage in science,” he said. 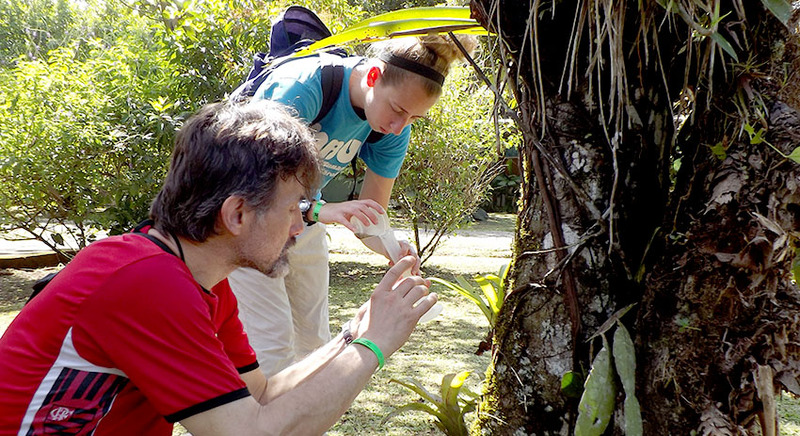 Biology Professor Steven Juliano works with undergraduate Taylor Zarifis on her research project at La Selva Biological Station. By 9 a.m. Saturday Duffield and her millipedes were out of the forest and inside a darkened cabin that felt like a sauna. She was using a red-lit head lamp to inspect pairs of millipedes separated into individual plastic containers. She used the red light because the millipedes don’t see red; consequently, she saw them but they didn’t see her. Duffield was investigating whether female millipedes prefer to mate with a male with whom they had previously mated or with a new mate. She suspected the latter because females can store sperm for a long time, which benefits their offspring if one of the previous mates is a dud. This practice, called guarding, allows the male to make sure the female uses his sperm to fertilize her eggs. The going was slow Saturday morning as Duffield waited for the millipedes to mate. This was new ground for Duffield, who normally studies the sexual selection of crickets as part of her Ph.D. studies, but she was prepared to wait it out.